Drifting off topic (as usual.....) the Harrier's visual cross-wind vane is there as it's VERY important that the pilot be pointing directly into the apparent wind when in vertical and transition modes. Otherwise the aircraft could get into serious roll instability issues. It's all explained very well in John Farley's book 'A View from the Hover'. Going back to the topic, in the 30s they had the steam vents right at the fore end of the flight deck because they didn't have the wind direction instrumentation back then and it was a foolproof system for the deck crew, air crew and bridge staff to see if the ship was going the right way. I recall that when they fitted steam catapults to the Ark Royal IV they did away with the steam jet as the cats leaked like sieves anyway! It's a visual back-up say should the bridge get taken out (there's another point on the ship to do the steering so I've heard) or the electrcis go down. Yup military vessels at least had an alternative steering position and then there was always the abilty to jury rig some form of steering, even if it took half a dozen crewmen on the wheel and a chain of men reporting the course to steer as the steersmen couldn't see a thing from most of these alternative positions. Don't know what they do nowadays - I mean they don't even have a proper wheel - but there must be a backup that rrelys on muscle rather then computers ? Ill take your guys word for it that it is there as a backup. Hm, I have a well worn copy of 'In the Wet' at home, I must check that out. There's a lot of very interesting aircraft in that book, all are whiffs except a DC3 or two, but I can't remember the dH Ceres. 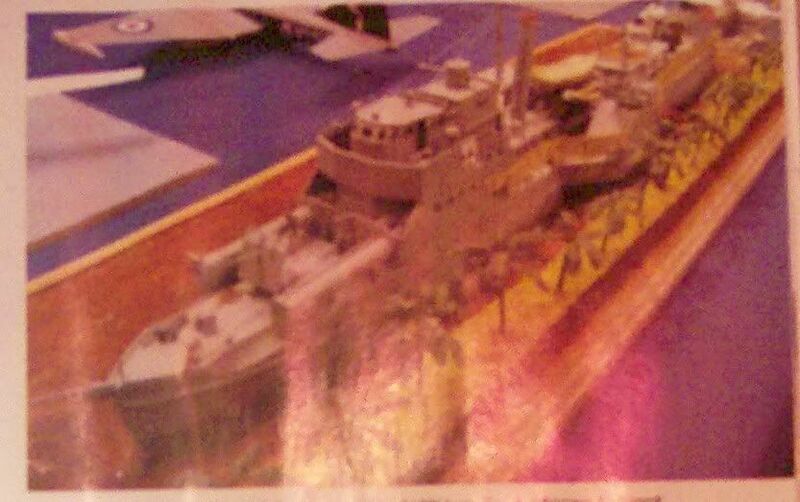 I couldn't find a picture o/l but while I was flicking through Model Boats magazine and came across a report on Scale Modelworld 2011 of an East African Schnellboot equipped with paddles. Isn't that Eddie Kruks ? pics of the amphib 163? From the January 1973 issue of FLYING, a 5-engined Cessna 172!!! I always would look forward to Bax's monthly wit and wisdom in Flying when my father had the subscription. He always made me want to get my license. But hey? Did she realize that if she uses that side machine gun she also loses her right arm?!? What IS she doing with that tap?? ?